Seams right! – Nice dress! Thanks, I made it!! Progress has been made on the two pairs of jeans I have been making. If you missed the first steps, you can read about them in my post here. 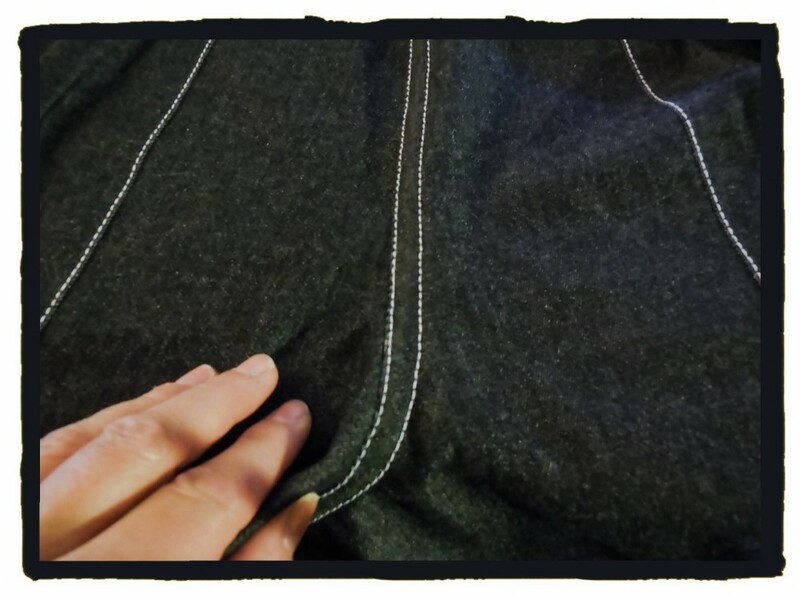 I have been following a Craftsy course, “Sewing Designer Jeans” with Angela Wolf and using bits and pieces of a couple of patterns, Vogue V2948 and Vogue V8774. I am happy with how my patch pockets turned out (last post). 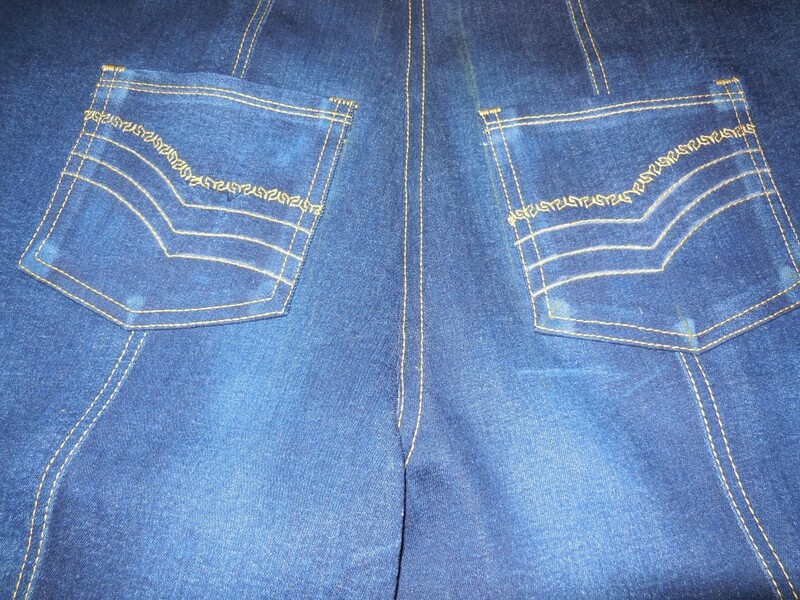 So next I move on to the back seams for both jeans. A flat felled seam. I marked the seam line. 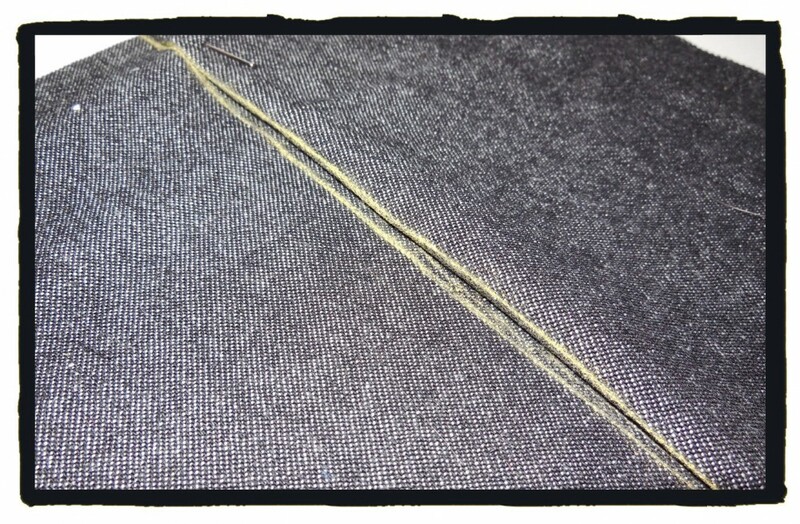 Usually you sew a seam together like this, on the seam line. 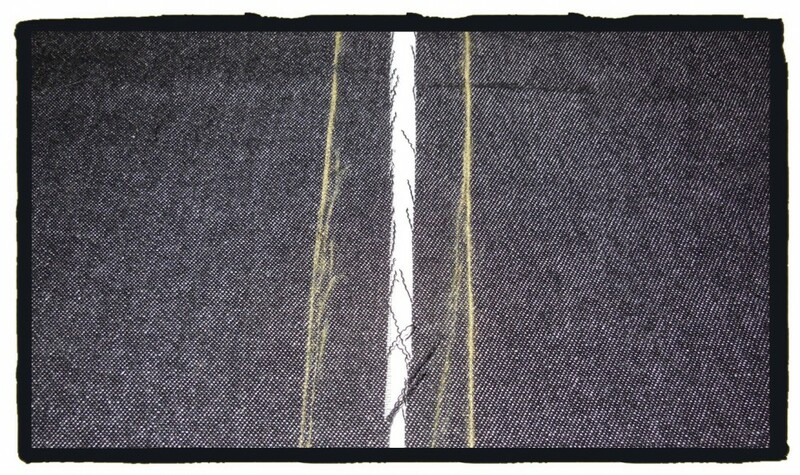 This time I wanted my seam lines to meet like this because then my topstitching and the flat felled seam would be perfectly centred on my yellow marked seam lines. This is how I pinned them together. 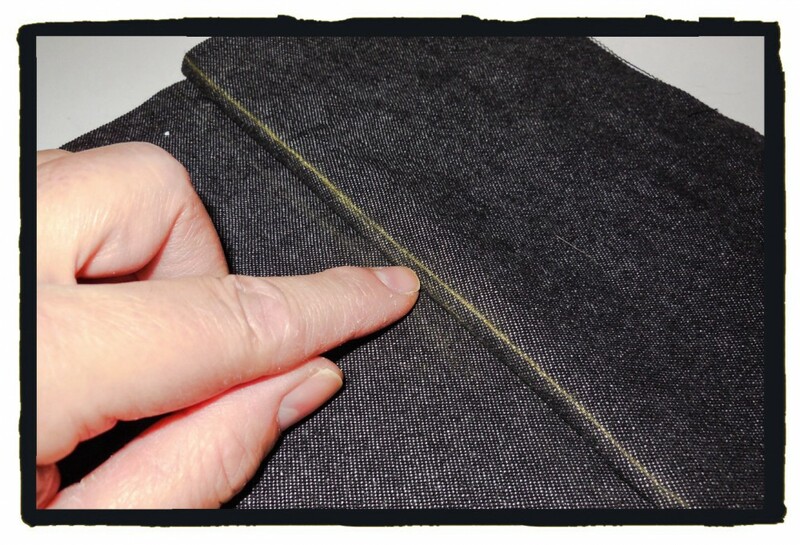 After sewing the seam together, you fold the long side over the short side and fold it under again, pressing it flat as you go. 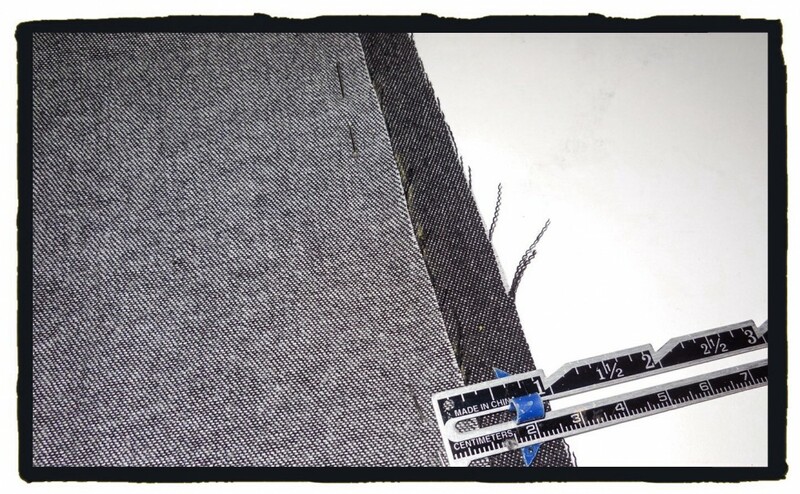 Perfect for topstitching a centred flat felled seam! 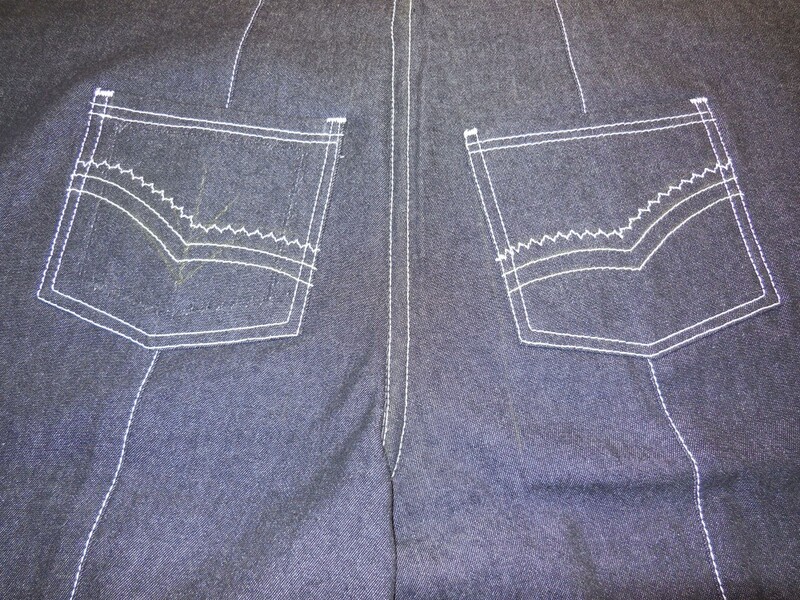 The backs of my two jeans are done now and I can move on to putting my pockets in on the fronts of my jeans. 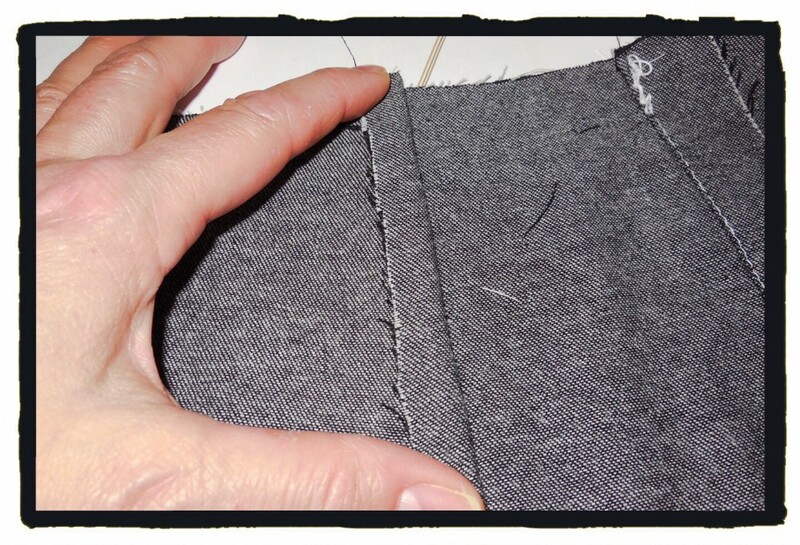 I cut out one-piece pocket linings and sewed the pocket facings and the coin pocket on to them. 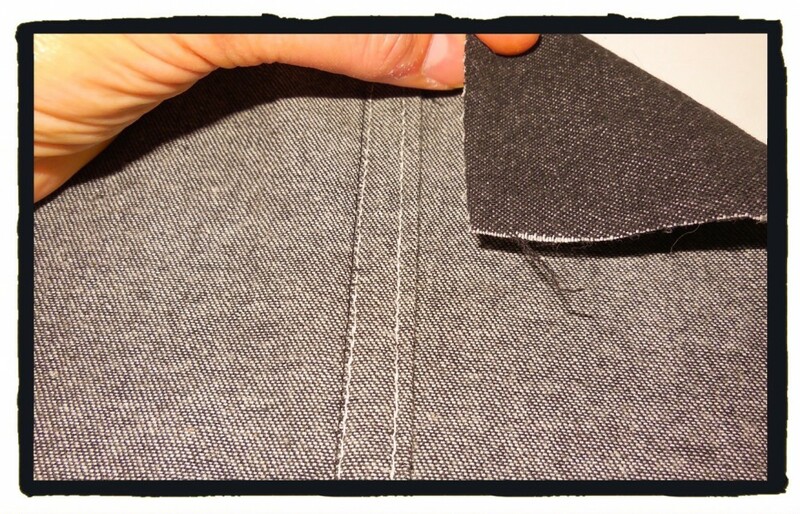 Then sewed them on to the fronts of my jeans and topstitched. 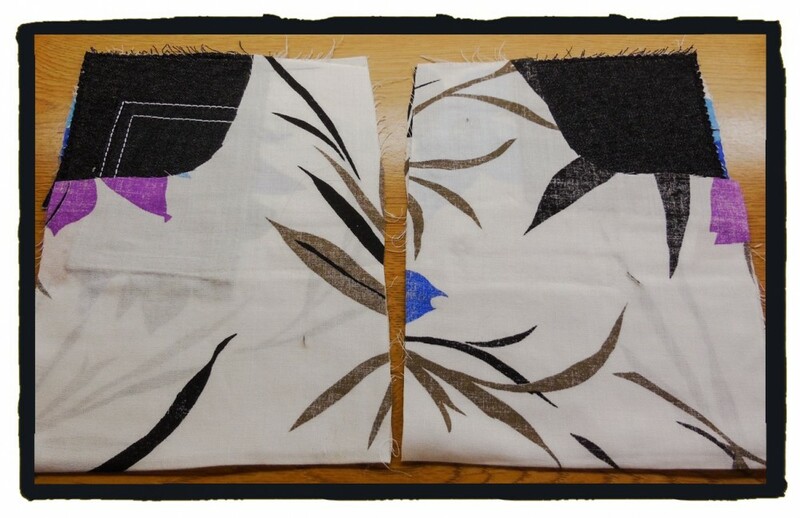 Speaking of topstitching, I have finished my distressing and my topstitching designs too. 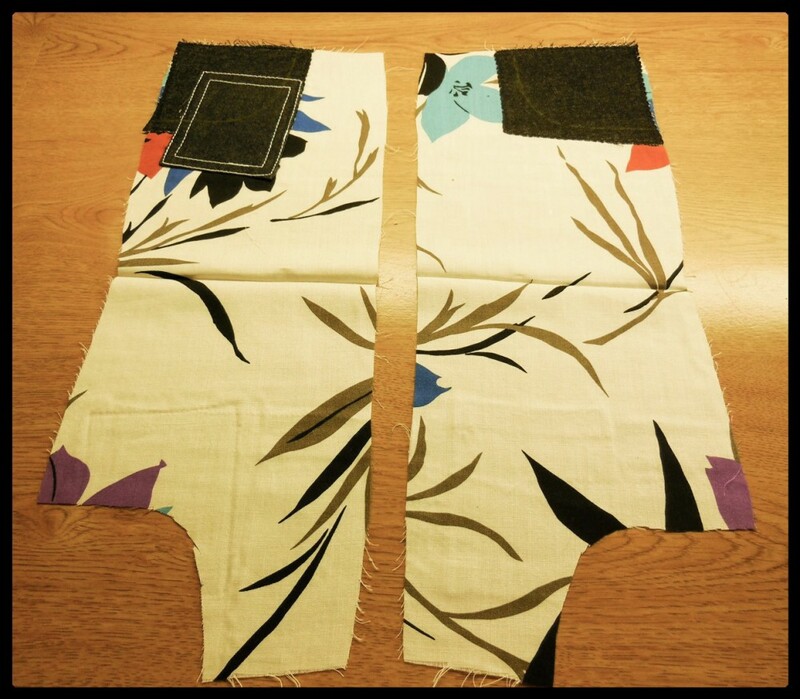 Here is the front leg (on the left) and the back leg of my black jeans – remember this pattern has a centre front and a centre back seam that I can decorate. 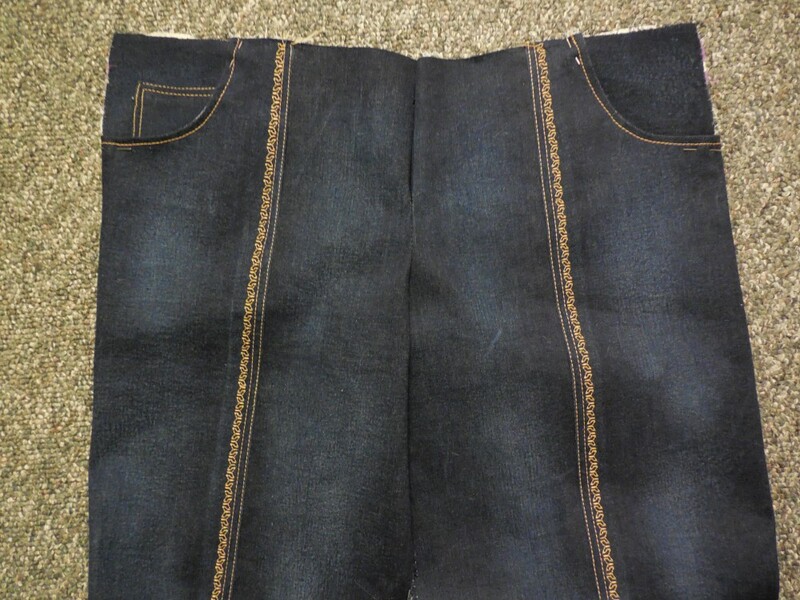 This pair wasn’t distressed because it is a polyester blend. 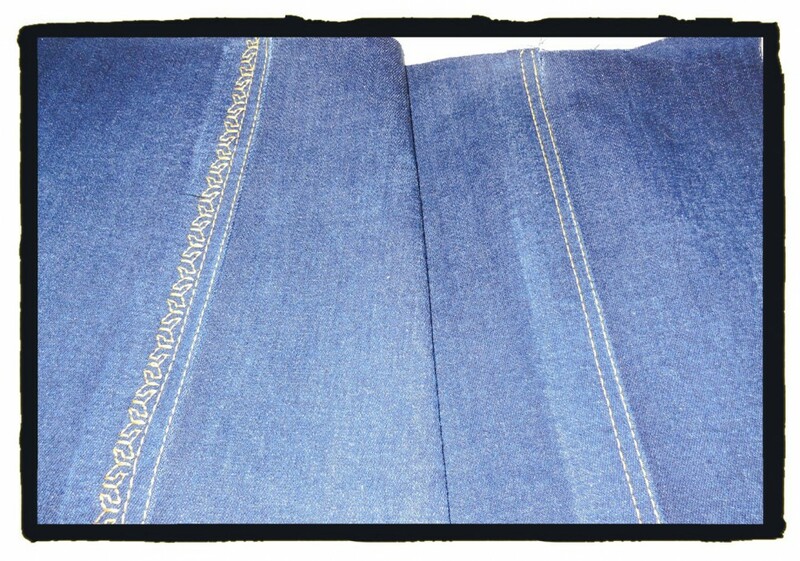 Here is my blue cotton denim, distressed and topstitched, front leg on the left, back on the right. I have to remember to always distress before I topstitch. Now that I have my patch pockets and my jean back pieces done and my front pockets and my jean front pieces done, it is time to do my fly front and sew my fronts and backs together. When I get more done, I’ll let you know. 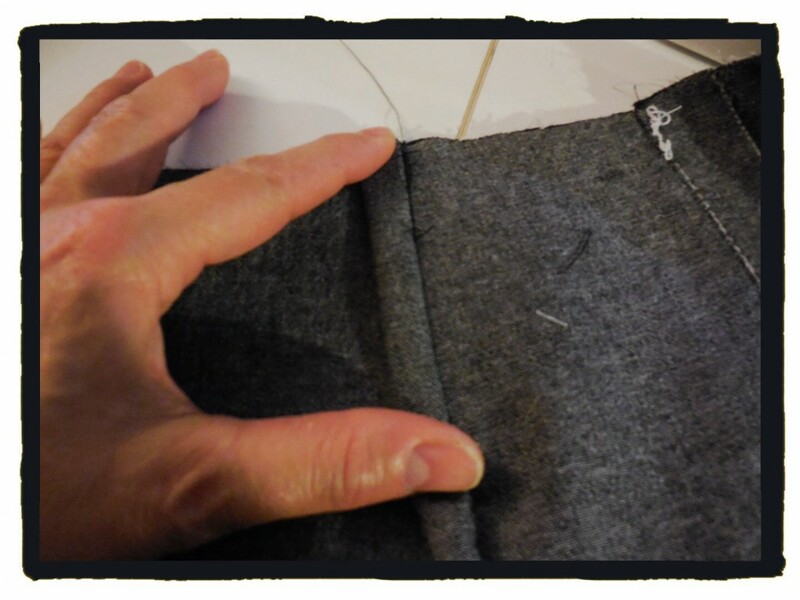 I’m curious… As you can probably tell, I have been going slowly and learning a lot, but also alternating this sewing project with other sewing projects. 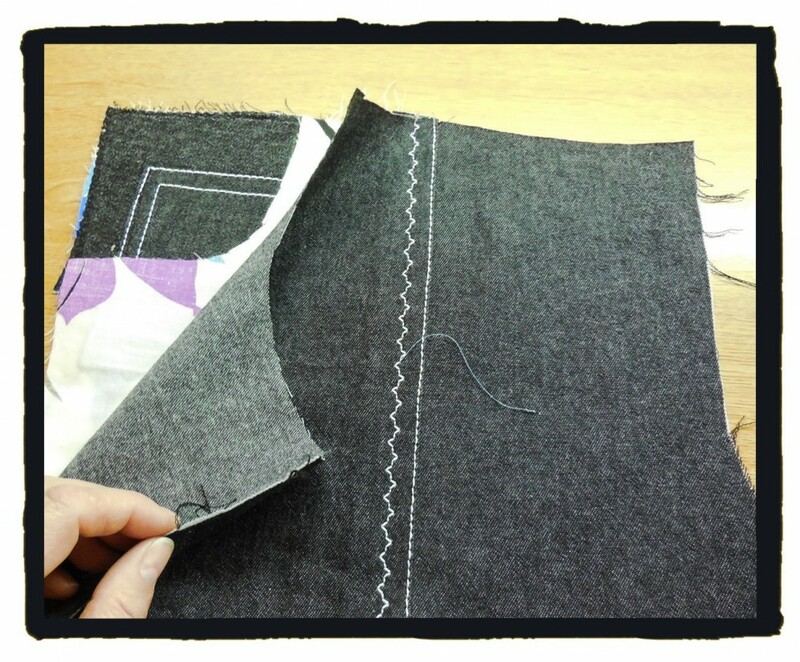 When you last did a project as large as this… I’m assembling two pairs of jeans… did you go at it steady until you were done, or did you alternate it with other projects, or even put it aside for a week or so? Oh my! Ya mean for once I am in fashion?? 😄 Thanks for the compliment! 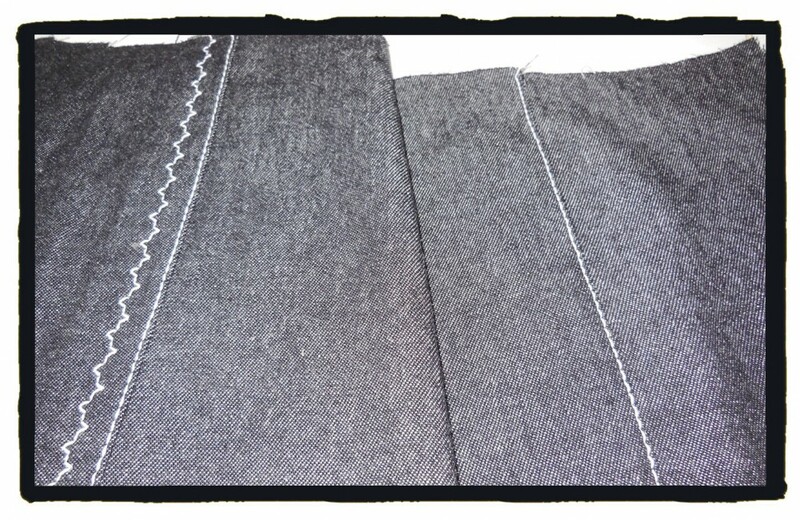 The distressing looks really cool, and the topstitching down the fronts is a beautiful detail. I usually truck through projects, but big ones do really eat away at your brain. Sometimes I manage to cut out a quick knit top on the side when I’m in the middle of a big project just to put together something quickly. The bonus of this is that you have something fresh to wear when your big project gets done too! Love it! “eat away at your brain” I agree, it’s always nice to have something new to wear, and the big projects do take a while. Both pairs look great. I love the pockets and the distressing looks great. Gosh, the last time anyone in our house made pants was my oldest daughter in high school. She had to make pajamas. She had sewn one leg, yet she and I could not figure out why the legs didn’t fit together. It took her father pointing out that she had cut out and sewn two left legs. Off to the material shop to get more material so she could cut out a right leg. Can’t wait to see the completed project. Thank you! That’s a great story! Hopefully mine don’t end up with a similar story… After all, I haven’t finished them yet! Thank you! I’m getting closer and closer to the end! I can’t answer for sewing as I only do one garment at a time (and I’m not on to adventurous stuff yet) but when it comes to knitting I always have two items on the go: a large one (such as a jumper or cardigan) and a smaller one (such as a pair of socks). It helps to break things up a bit when you need some respite. Absolutely, I’m finding it does help to break things up! This big project has been going piece-work and I’m enjoying sewing it up! I’m going a little wild on the top stitching, but it is fun. I thought the flat fell seams would have been harder, but they were actually pretty easy to do! 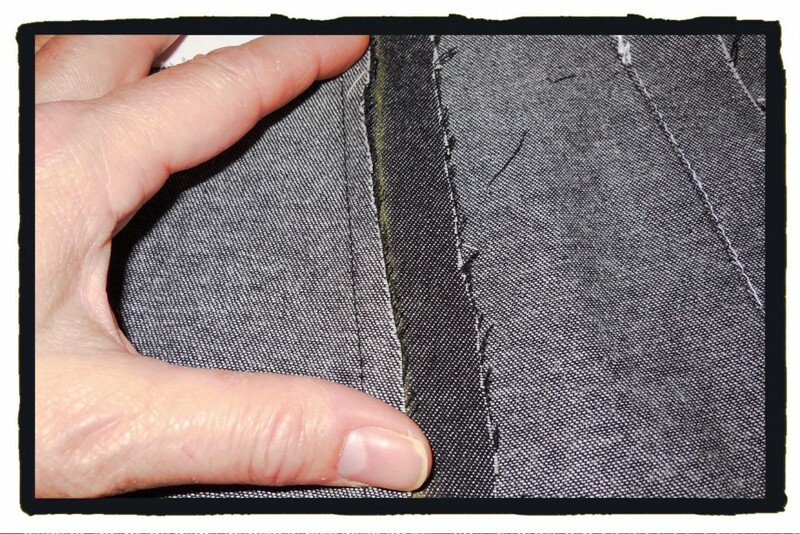 Your top stitching is amazingly neat and the seams look so professional! I really like to get into a more involved project from time to time – I have been taking it easy with lots of knits over the winter but I am looking forward to trying something new – I don’t think I am ready for all the hassle of trying to fit jeans to myself though! I admire your dedication to the jeans you are making, I don’t think I’ve ever done a large scale project before. I did try make a blazer back when my skills weren’t the best and it has been squished at the bottom of my stash for ages now, oops! 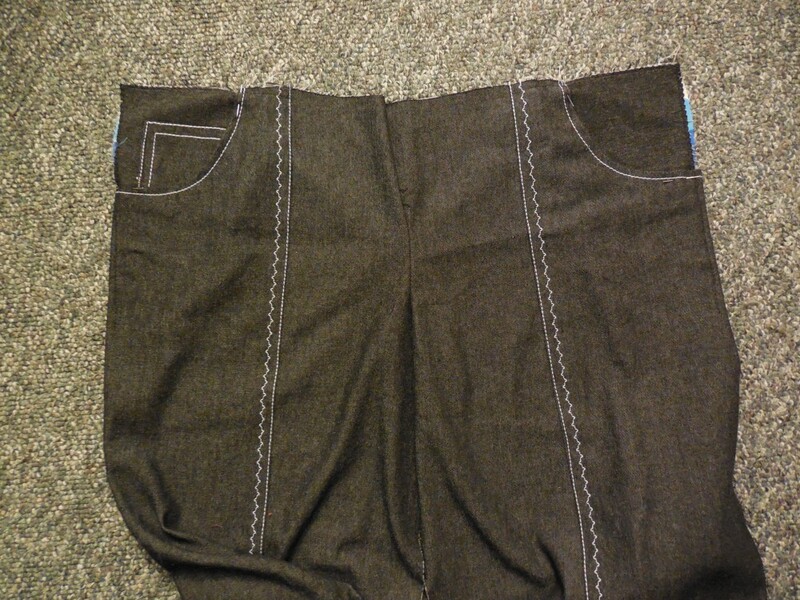 Nice pocket linings! Your top stitching and embellishment is so neat too.